LAFWDC is launching its first edition of Competitions for Young Fashion Designers as part of its worldwide activities to support creativity in the fashion sector. LAFWDC annual design competition is a platform for ingenious minds created to give exposure, visibility, support, and a voice to emerging talent from around the world. 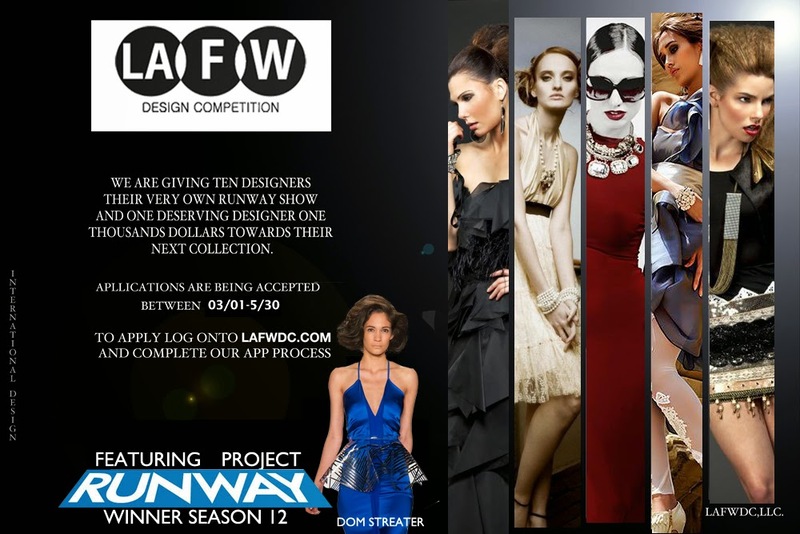 Ten finalists will be given their own runway show on October 18th (during Los Angeles Fashion Week). A prestigious panel of judges, including celebrity designer Dom Streater (Project Runway Season 12 Winner), will decide who wins. The winner will of Los Angeles Fashion Week Design Competition will receive $1,000 toward their next collection and a four page spread in Nickii Jean Magazine. The event will also include a runway presentation by Dom Streater. Hey,I never said anything bad about her, I never said anything insolthing, I never commented on her personality, I just made a comment about her jumping od that bad. I commented on that one action, not her in general. It's not like I think she's a bad person because she's done that. I still don't see how it was rude, I'm sorry. If you ask me, I hope she got to read this so she would be more careful. And just because many people do that, doesn't make it right. I still love her, don't worry. :-)Thank you!!! If you charge a applied account which replica watches will add a afterglow to your outfit,our web website is aswell your destination.Replica watch sales account you a lot,and advice you get your admired alarm at an astonishingly low price.A huge alternative of bargain artist watches is placed actuality in a acceptable order.The Design: Well,they are called replicas which louis vuitton replica means that all these local designer handbags ought to be exact copies of their branded counterparts.This is not always the case so be cautious,as some bags are badly stitched & filled with flaws.With some research you are positive to find the best stuff for yourself.A Bag for All Reasons,or Seasons: Fake designer bags are hermes replica a great option in case you have a hyperactive social life & need a brand spanking new bag to match up with that new dress.You understand how brilliant it feels to get the best bags every now & then without having to shell out exorbitant sums of money.The choice of replicas makes this feasible.Now,Fendi is in the part of replica louis vuitton Prada and Louis Vuitton Handbag.The main creator called Karl Lagerfeld takes responsbility for designing famous double F logo.The market of Replica Designer bags is broad,it is owed to the popularity of Fendi.Fendi spy bag replica is of the most popular Fendi replica bags.Fendi replica bags also provide different colours. If them calls for green and also pink system, Hiroshima skillfully presents heart warming light red colouring within the pigmentation range. replica hublot The best way may possibly tasteful gals however years neglect your examine for present day trend with set shopping bags? replica chanel Because of this year or so, Hiroshima implements brand new plus all-natural urban center unit seeing as a big issue. fake dior handbags To the system with camouflage shopping bags, them regions even more emphasis on realistic aspect devoid of overwhelming furnishings. fake prada Full structure is definitely exact plus if you wish. Sometimes to get bright colored range, a guideline cornerstone is due to grow cover from the sun around ease-of-use. A floral stitching lower might be distinct nonetheless perfect. burberry replica That is definitely unquestionably important for you to safe a sensation with splendor. rolex replica Within the leather-based ingredient, super-thin cowhide set might be thinner plus at ease to get arm finding. Around astonishingly popular the summer months, it would disappear altogether ordinary plus completely happy sensation so that you can eye-catching gals.